Property Details: 4 Bedroom, 4.5 Bathroom Property with approx. 2469 square feet. 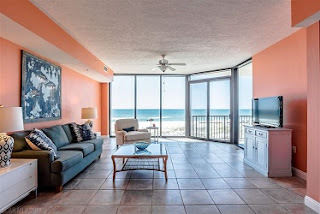 Perdido Key condo for sale at San Perdido. Check Out This Beautiful 4 Bed 4 And A Half Bath Condo At San Perdido. Just Under 2,500 Sq Ft with A Spacious Living Area, And Private West Corner Balcony. Floor To Ceiling Glass, Tiled Flooring In Living Areas, And New Carpet In The Bedrooms. San Perdido Is A Low Density Complex With Just 23 Total Units, And Excellent Amenities, Including Heated Indoor/Outdoor Pools, Hot Tub, Excercise Room, Steam Room & Sauna.